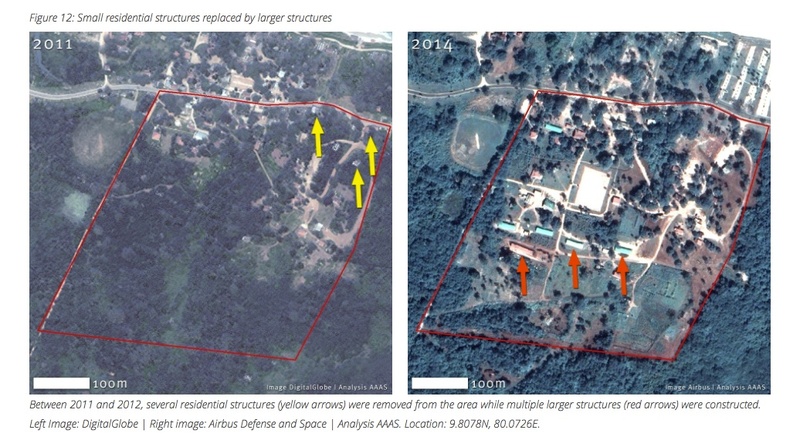 Exposing blatant lies spewed to Northern civilians by the military under the blessings of the Rajapaksa-regime in order to support the rampant land grabbing racket following the end of the war, a close analysis of satellite images have disclosed that over 50% of the land acquired by the Army through such means is not being used for its stated purpose. The analysis that had been carried out by the Geospatial Technologies and Human Rights Project of the American Association for the Advancement of Science (AAAS) upon a request made by Sri Lanka Campaign for Peace and Justice, has revealed the majority of the 25 sqkm stretch of land in the Jaffna Peninsula that is presently declared out of bounds to anyone except the Army and those they permit to enter, has not been deployed for its stated ‘public purposes’. The land that had accommodated close to 2000 Tamil families before the conflict was abandoned during the war. However, following the end of the war, its original owners have sought legal assistance to reacquire the lands that have been encroached upon by the military, but to no avail. Commenting on the facts that have been exposed, Campaign Director for the Sri Lanka Campaign for Peace and Justice, Fred Carver had stated that the satellite image analysis has revealed that the military deprived close to 2000 people of the right to their original lands to line the pockets of the Sri Lanka Army. “More seriously it suggests that the Sri Lankan Army is still keen to ensure that it’s military are a visible and active presence within the day to day life of Sri Lanka’s northern Tamils – a form of state oppression which, combined with systemic human rights abuses, we have previously deemed an ongoing crime against humanity,” he has added.